In my review for The Tomorrow People Season 1 Episode 12 (in between all the squeeing over the John and Astrid scenes) I berated myself for not figuring out that Luca was a paranormal. Well, don't expect me to do that again in this review because, I mean, come on. Who knew that was coming? I am not going to feel even remotely embarrassed about the surprise at the end of The Tomorrow People Season 1 Episode 13. Stephen's mom being a paranormal was the best kept secret this show has had so far. While I had some moments of wondering about Luca, not once had I even considered the possibility that Marla might have powers. It makes perfect sense though, knowing what we know about Stephen's abilities and powerful he is. The revelation does make me wonder if Jedikiah has known all along or if he has no idea either. I'm guessing he doesn't know because it would seem like he'd be trying to capture Marla if he did know. Then again, who knows? That guy could also have a million reasons as to why he would keep something like that a secret. Thanks to Cassie's story and discovering that her father (aka the Founder) and her mother were both paranormals, we know that Stephen is a synergist. But it also makes him less unique than we thought he was. After all, Cassie is also out there and perhaps there are more. Does this mean that maybe Stephen doesn't have to carry the entire burden of saving all of the paranormals himself? I guess we'll have to wait and see. I had the pleasure of doing an interview with Madeleine Mantock (who plays Astrid) earlier this week, so I had a pretty good idea that nothing was going to happen between Astrid and John. I think I'm okay with them being friends for now. I like the bond that they have and if that turns out to be romantic, I will enjoy it probably even more. But I'm not dying for it either. As for John and Cara, I found myself kind of rooting for them in the beginning of this episode. Like I've said before, it's not necessarily out of a feeling of being certain that they belong together. It's more that I feel for John when he's pining for her and it broke my heart a little when she told him they needed to forget the kiss. Could it have been a little bit of resentment then that led him to rebel so hard against her orders? Honestly, I don't think so. John was leader long before she was and he definitely has his ideas of how things should be done. I guess it was bound to happen that they would have a major dust up, but I don't think I expected it to happen quite this fast. Where will John go and what will he do now? What will Stephen do now that he knows about his mother? Will we ever see Cassie again? Those are questions we have to wait at least two weeks to find out. I don't know if I'll be able to hang on that long, but I'll try. What was the biggest shock in this episode? 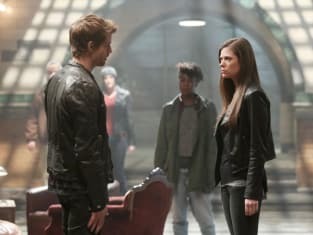 John and Cara's having a massive fight that ended in him getting kicked out of the lair. Cassie finding out that her entire past was a big, fat lie. Marla turning out to be a paranormal.